Coffee drinkers now have another great reason to choose McCafé coffee from McDonald’s Canada over the competition. 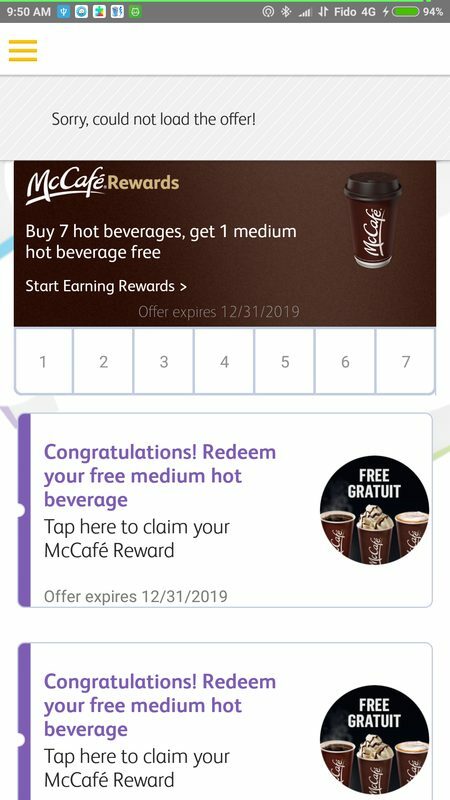 Besides just tasting great, you can now collect digital rewards stickers when you use the My McD’s app and earn a free medium hot McCafé beverage after every 7 cups. The program was first launched last year in British Columbia, Alberta, the Northwest Territories, Yukon, Lloydminster, SK, the Quebec City Area, QC, and Halifax, NS and surrounding areas and was finally released to the rest of the country. RedFlagDeals members outside of those areas first reported seeing the new rewards system early last week. 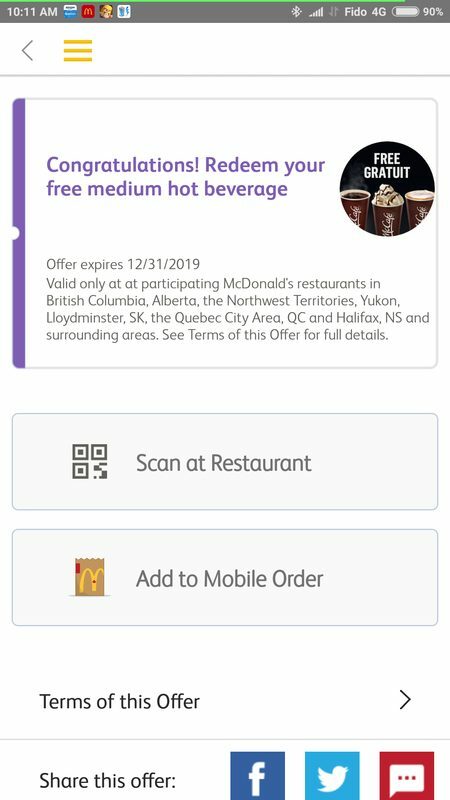 McDonald’s Canada appears to have backdated digital sticker accumulation to an unknown point in 2018 as many users, myself included, were pleasantly surprised to find free coffees and partially completed digital rewards cards in their accounts. The best part of the new digital rewards program is that it hasn’t replaced the physical sticker program so you’ll still be able to collect stickers on your coffee purchases. 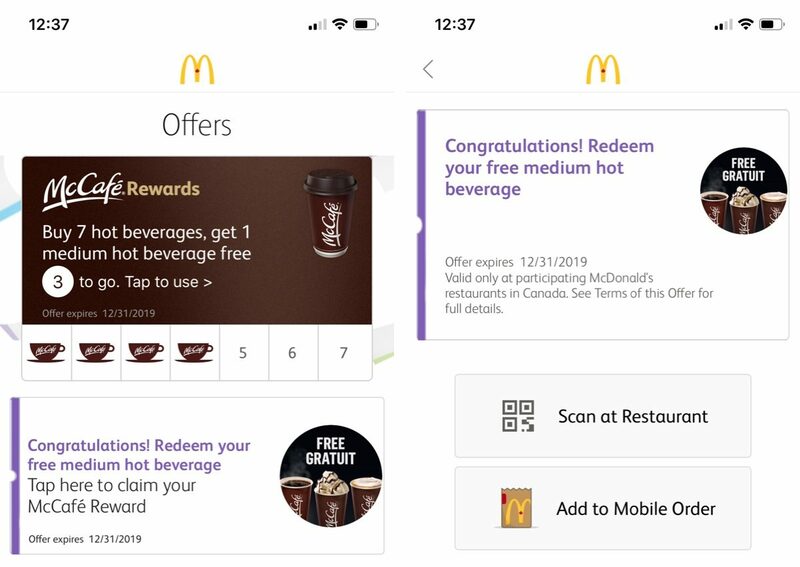 Those who make all of their coffee purchases via the app will now receive 2 free McCafé rewards after completing their digital and physical rewards cards. It appears that the McCafé digital rewards program will not be replacing the physical rewards program and the two will run concurrently. Are you a fan of the new McCafé digital rewards program? Let us know what you think in the comments below. Wonder if this means they'll be getting rid of the stickers and going app-only? Too bad their app is a piece of ______. Weird. Do your free coffees say only valid BC, AB, NWT, Lloydminster, Quebec City and Halifax? Guessing it's just a glitch. Nice. Got 3 out of 7 already from past purchases. Interesting - I see the one here for mine in the GTA as available now and I can use it. Thanks OP, deal confirmed in ON (GTA)! Perfect timing to pair with $1 coffees. I don't know if it's out of the question. In the States, they don't have stickers. It's just the app. McD App always glitches for me, always get the Sorry we're having issues, restart the app. Used it this morning. Looks like a glitch, but it worked so far. I want to save the reward till m coffee is not $1, but I am afraid that mcd would have fixed the glitch already then. Lmao. Just got 23 free coffees. I think it's MCds wya of telling me I have a caffeine addiction. A nice surprise on this cold day. I've got a few free coffees loaded up in my account. Awesome! I checked the App and I have 2 free coffee rewards and 4 of 7 for the next. I'm in Ontario and been buying thru the app for most purchases last 3 months or so. I thought they were doing this already in BC...well at least in Vancouver. Went on vacation there last September and the app was displaying I had three "stickers" towards a free cup. Cant remember though if there were stickers on the cups themselves. Anyone in Vancouver care to chime in? Doesn’t seem to work if you use with the mailer coupons. Also, I’m kinda hesistant on putting my CC info and personal info into this app. They should accept Apple/google pay - it’s a no brainer. At the very least they should let you use their McDonald’s gift cards in app. No free coffee for me. i guess using the Kiosk always didn't payoff. Next time, go into store, use free wifi, use app, order, done. I have data... Just never used the app for payment/ordering. I have 12 free coffees in my account! Expires 12/31/2019. Sweet! I seem to get this daily. the best way for me to fix that is to on Android - hold the app icon and select "App Info" -> Storage, Clear Cache... After that I can re-open it and it works as it should. After the $1 coffee promo that ended Dec. 16, there was a bug where you could still get $1 coffee if you went to your recent orders in the app and just re-ordered it. It worked for a few days until one day when I went in to re-order and all my past coffee orders were gone. Hi....new here. Curious how I already got 5 stickers when I never ordered using the app. Strange. Take them and run! I only have 1 and I am surprised at that even as I don't think I have purchased that many coffee's through the app either. Great update. Congrats to all those who were smart enough to be using the app to order coffees all this time.